As Summer has turned into Fall, it’s important for children to understand the changes that come along with the shifting of the seasons. 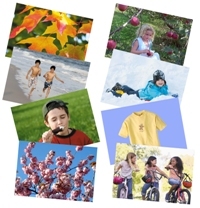 This deck of Seasons Flashcards shows the activities of each season and what clothes we wear so that children understand how the things we do both inside and outdoors are affected by the time of year. The included cards depict how we snuggle under the covers in the winter cold or splash in the pool in the summer heat. With Autumn in full swing, this is the perfect time to introduce this concept. To save 15% this week only on the Seasons cards, enter the Promo Code BLOGSF11 at checkout. *Offer expires on October 25, 2011 at 11:59 pm EST. Not compatible with any other offer. Be sure there are no spaces after the Promo Code when you enter it at checkout. Written by: Different Roads to Learning on October 19, 2011. This entry was posted in Difflearn Promo Code, Pick of the Week, Products, Sale, Speech & Language and tagged ABA, Applied Behavior Analysis, autism education, daily routines, Different Roads to Learning, Early Intervention, language development, learning, Resources, teaching tools, visual supports by Different Roads to Learning. Bookmark the permalink.